November 1, 1994 – Tuesday – 1:10 a.m. Earlier today (Monday) I ran into Ellen and Suzanne and we, on the spur of the moment, went up to the very top of Beech Mountain. I honestly believe that I saw the whole world. Several years ago there was a small amusement park up there called The Land of Oz and the yellow brick road is still there. It’s a little run down, but it was amazing to actually find a true yellow brick road on top of this huge mountain. Purely magical. Suzanne was so amazed, she took a brick. After we returned she gave it to me. I don’t want it, I feel like it should have stayed on the mountain. When Jeni gets back I’ll take her up there and we’ll put it back together. 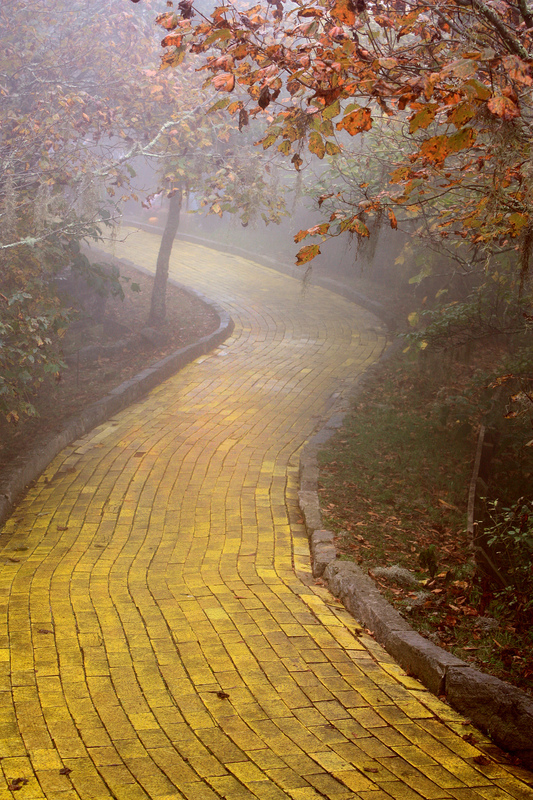 Then I can hold her hand and stroll down the yellow brick road on top of the world. The concert was great tonight. The Holy Spirit was there. So many young people came to know Christ. I really like this church. I know Jeni would have enjoyed it tonight. Afterwards, Charlie and Jason and I watched Jurassic Park on video. And today was the first full day in six weeks in which I haven’t kissed Jeni. October 31, 1994 – Monday – 9:40 p.m.
It’s also Halloween, but that’s not nearly as important. Last night Al, my acting partner in Of Mice and Men, and I helped Mr. Angel move. He is the director of religious and campus life here at Lees-McRae. I really like him a lot. He comes to FCA meetings. I can’t remember if I told you about Al or not, but he is not all there. There seems to be some sort of learning disability or something going on, which can be a little annoying, but at the end of the day I’m no better than he is so I’ll try to be patient. He reminds me of Misty. Jeni will be back in three days! It was only Glenda and I at our breakfast Bible Study this morning. She used to be at odds with Charlie, but now I think she is realizing how stupid all of it was. She is handling this situation like Jesus would. Tonight there is a concert at Heaton Christian Church: Brian White and Justice! It should be a lot of fun. I wish Jeni could be there though. October 30, 1994 – Sunday – 3:05 p.m.
Jeni has gone. She won’t be back until Thursday. I miss her already. She wasn’t able to go to church with me this morning; she had rehearsal. Last night she and I talked to Charlie for a long time. There is this girl that Charlie has been interested in. He finally asked her out last night and he was telling us how it went. He was nervous. I went for a walk this afternoon and ended up in a place I had never been before. It was really pretty. I really don’t know what I’m going to do since Jeni is gone. If she was here, I’d be over at her room right now. I’ll survive though, this will show me how important she is to me. I called my mom this morning since I needed some money. I also talked to my dad the night before last. Last night, we threw Tracey a surprise birthday party and we played a few games. About 20 people were there. Everyone had a lot of fun. Tracey will be 19 tomorrow. Her birthday is on Halloween! Speaking of Halloween, November is almost here! I have been here at Lees-McRae College for two months now, and I have not yet returned home. When I do finally go home it will be 2 1/2 months since I’ve been there. That is a long time. And I am a different person now from who I was on the day I left. I have met so many new people since that day. And I have fallen in love with one of them. October 27, 1994 – Thursday – 11:10 p.m.
Today I went to court with Jeni for her speeding ticket she got on the way back from Carowinds. It was rough, but she made it through. She got the holy crap scared out of her and she probably won’t ever speed again. The only thing she had to do was pay the fine and the court cost. It totaled $110. We ate breakfast and lunch out in Wilkesboro since it was over an hour from Lees-McRae. She was glad I came along. She said she really needed me since it was a stressful event. I missed my classes for the day, but it was worth it. She leaves for tour Sunday night and she will return the following Sunday. Now I believe I’ll write her some letters. One for each day she is gone. October 26, 1994 – Wednesday – 11:20 p.m.
Glenda, the FCA President, asked Tracey, Jeni and I to lead FCA tonight. We did and I lead the group in a game. Everyone loved it and said they learned a lot. Today I met Jeni in her room as I usually do at 3 o’clock on Monday, Wednesday, and Friday afternoons. Besides lunch, it is the only time we spend together until all of our classes are over. Her presence is so relaxing. The Lord is blessing me and I don’t deserve it. My savior is so good to me. Thanks you for this school and for my education. And thank you for Jeni and her heart full of love. She is so special to me. I can’t imagine how special she is to you. And I’m really thankful that she loves you more than she loves me. October 25, 1994 – Tuesday – 1:40 p.m.
You will not believe what has happened. Last night I went to James’ room. While I was there someone called me and left a message. I was expecting a call from Jeni, so I checked my messages from James’ room. I had a message from Pastor Steve. Crazy! But guess where he was? In the Student Center. His message said that they were staying at the Archer’s Inn and they would try to get in touch with me tomorrow. It is now tomorrow and Jeni and I plus Tracey and Rachel met up with them and talked for about 30 minutes. I was late for my 11 o’clock class, but who cares! Anyway, they are doing great. We talked about tons of stuff. That man and his family are so wonderful. He sees that I am doing great and that made him happy. I’m going to go see Jeni now. October 23, 1994 – Sunday – 11:55 p.m. I miss her now. I want to hold her. She is a part of me now. And I have fallen in love with her. I can say that with no doubts. She cried last night after visiting Craig and Coletta (her youth pastor and his wife). The two of them are wonderful and my eyes were filled with tears as well; mainly because I knew she was hurting. I will hopefully go back with her for Thanksgiving. In a few weeks Tracey and Jeni and I will go back to my home just for a weekend. In one week exactly, Jeni will leave for a dance tour that will last an entire week. I will miss her so much.